The Nazis killed the Soviet civilians and prisoners of war the next day, they entered to Smolensk. The Germans invaded in the city in the evening of July 15, and on July 16 at the place of today’s Pioneer Park, they organized a «filtration barracks». Nearby, near the ramparts there were graves for dumping the bodies of the first gunned down. On the July 20 in the area of Krasninsky highway on the territory of the former military warehouses, the occupants created the big concentration (transit) camp (“dulag”) № 126, for the prisoners and civilians who were detained because of violation of the occupation regime suspicion. It was the extermination camp itself, it was impossible to survive there: common wooden sheds cold without anything at all, with dirt floors and without any hint of the toilets even in the form of holes (here from — the eternal dysentery); work — as it should be for Untermensch («subhumans»), with no hope of rest; food — 200 grams of ersatz bread per day and a wash from potato peelings with manure on top twice a day. Those who could not work, were moved into «the death barracks «; on the third day of work missing, prisoners were destructed physically. The civilians were not on ration and had to feed, getting packages from relatives; and it is clear that they almost didn’t receive the products. 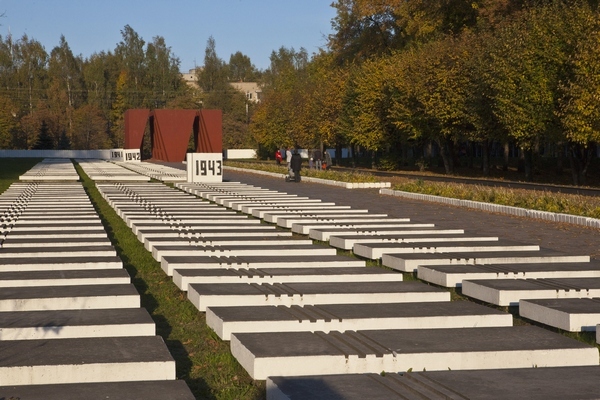 According to the Soviet Extraordinary Commission act and the inquiry about the mass extermination of war prisoners and civilians dated October 21 1943, in this camp during the period from July 20 1941 to 25 September 1943, the Nazis had killed at least 60 thousand people far and by. Today on the «dulag-126″ place, on the crossing of «Normandy-Niemen» regiment and Zoe Kosmodemyanskaya streets, there is a memorial cemetery, where 45,000 Soviet citizens are buried. 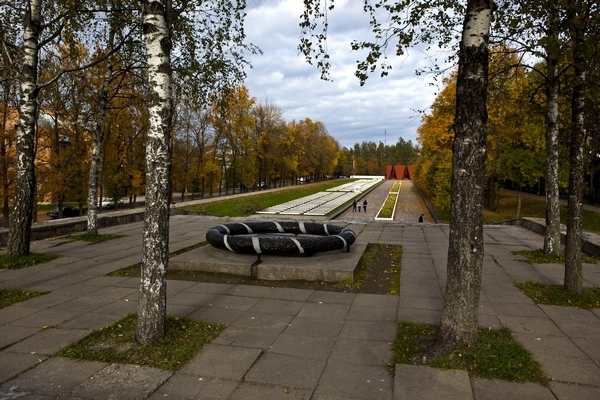 It was opened in 1975, the authors of the memorial design were – the architects G. Soosar and E. Antonov. 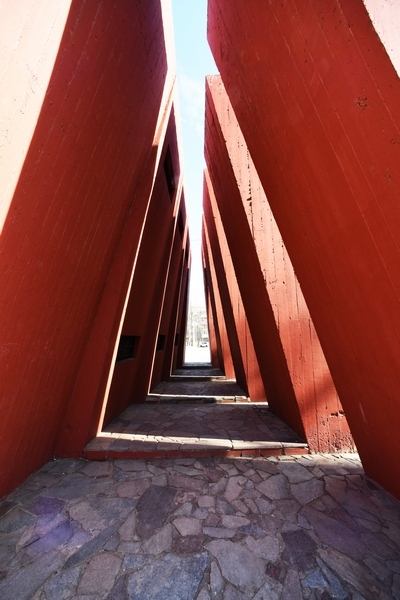 At the entrance there is the memorial complex, in its center there are concrete trapeze slabs of five meters high, and on their sides there are embedded lattices, made of a metal rod, and symbolizing the chambers of the concentration camp. On the eastern side of the first plate-stone there is the inscription: «Here were buried 45,000 Soviet citizens — prisoners of the concentration camp, tortured by Nazi executors in 1941-1943. The memory of you is for a full due! «. In the western part of the cemetery there is a hill-barrow, on its top there is a platform with a metal plate, framed by a black wreath. On the plate there is an inscription: » The eternal memory for those, who were brutally tortured, executed, but not submited » . 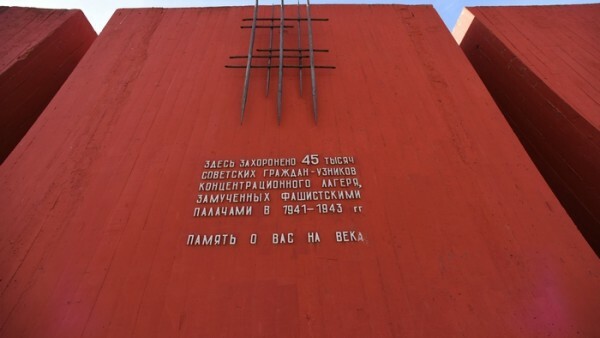 Today «The mass graves of 45,000 Soviet prisoners of war, died in a concentration camp number 126 in 1941 — 1943.», is located on the corner of the Normandy-Niemen and Zoe Kosmodemyanskaya streets, and «The location of the German concentration camp number 126 for Soviet prisoners of war, 1941 — 1943″, Normandy-Niemen Street — are the cultural heritages (the monuments of history and culture) of regional importance.